Actually, children have a natural urge to move, which is very important for their health and physical development. But due to the stresses of everyday life or bad weather, the desire to move often falls by the wayside. This high quality children Hoop in colorful designs makes the TV or the console look pale: Small professionals will love the upbeat style with 21 color combinations for individual taste preferences. Even couch potatoes will love to train with this Hula Hoop for children, especially the healthy movements are not perceived as strenuous exercise, but as a pure fun. Convince yourself and your children if you still know the lively hip movements from your own childhood. "Wooden times" are long gone, because the robust and resilient material ensures a functional base with desirable flexibility. By choosing a diameter, you can take into account the physical conditions. 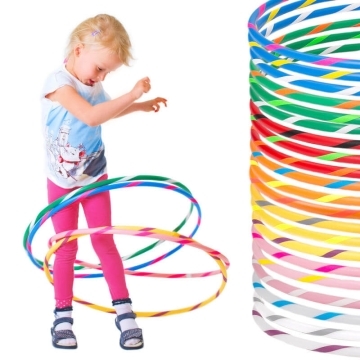 Colorful kids Hula Hoop: a childhood classic reinterpreted in a peppy way! more healthy exercise in everyday life: Hooping is pure fun! It has been proven that adequate exercise is important for the health of children. 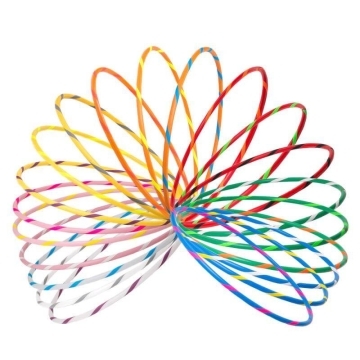 With this high quality and functional children's Hula Hoop, you are making an active contribution to health in everyday life because regular exercises improve the posture and strengthen the entire organism. The spirited workouts will be perceived as pure fun. And with the right music in the background, the motivation or sense of rhythm can be increased. Learning the technique is not a problem for children with this Hula Hoop as failures may contribute to the amusement of small professionals. Very quickly, pride and more motivation will be generated when the first successful results can be seen. The grip tape not only looks good and colorful, it also helps to increase the level of adhesion so that the Hoop can be easily kept up. Understand this table please as orientation because of our experience and not as strict binding statement. Order this Hula Hoop for kids (manual production) online: We wish you and your offspring with this children Hoop many truly "moving" moments and a lot of health-promoting fun!